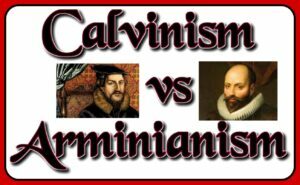 Calvinism and Arminianism is an age-old schism within the Church of which many Christians are under the impression that these two views are the only two possibilities which pertain to the doctrine of election, with no alternate view. Each view appeals to scripture to substantiate its point, but each view takes its point to an extreme which cannot be reconciled with the other. Yet the alternate view does not discount certain truths from both sides, but considers the full spectrum of truth in a more balanced and well-rounded way. Neither view of Calvinism and Arminianism disagree with the core principle of election as defined above, but differ upon the basis of God’s election. This doctrine obviously implies a discriminatory element, and it is exactly the premise of that discrimination which is in debate. Is the basis of God’s choosing rest solely upon His sovereignty, or does it include some cooperation from each individual? Many find themselves rather perplexed by this debate – while recognizing biblical truths from each side as well as problems from both, yet are more or less pressured to take a side. Let me just validate anyone who is reluctant to ‘pick a side’ – who just might have better discernment, or at least a more balanced approach to such matters than those who have chosen a side. As for me, I refuse to sidestep around certain truths, challenging as they may be, nor resort to ‘creative interpretations’. I would rather be challenged by the astonishing truths of God than to cheapen them with the arrogance of thinking to have it all figured out in a handsomely wrapped package. This debate regarding a subject which springs from the depths of God’s infinite nature, is quite vast, as such volumes of literature have been written on the subject to fill entire libraries! So I will not rehash what has already been covered by countless authors, but will endeavor to bring a more objective and well-rounded perspective than the typical stance, and hopefully foster a broader view, greater clarity and even some rest from the anxiety and agitation of this great debate. I must first say there are certain truths which are so clear and straight-forward that it may be both reasonable and logical to take a set categorical stance on. When God says, “I am the LORD, and there is no other; There is no God besides me.” (Isaiah 45:6) – this is a very plain and logical revelation which excludes the alternate view of polytheism, so we may reasonably and logically take a set categorical stance on the clear and simple fact that there is one God. The same applies for the concept of one mediator (1st Timothy 2:5, John 14:6) – as it would be a mathematical impossibility for another equation to coexist. There is either one, or there is more than one, but both cannot logically be true; and since God expressly tells us what is clearly true, we can hold fast to that truth. Yet there are dimensions of God’s nature which go beyond our comprehension, which is described in the scriptures as being multi-faceted and even unfathomable (Ephesians 3:10, Romans 11:33-36). It should not be surprising to realize the manifold wisdom of God stretches far beyond our understanding. Can we really expect to contain an infinite God within our finite minds? This question and/or realization should compel us to keep a wide space for reservation on such matters of the mind of God which cannot be fully fathomed. Certainly God has revealed the mystery of the gospel, so we may comprehend a number of truths, yet such truths still go beyond our full reckoning. Notice how Paul does not conclude the subject with full resolve, but leaves it rather suspended. Human nature hates having loose ends and unresolved studies – we just want to nail it to the ground and say we have conquered it. But Paul, confident as he is, does not presume to have it licked, but maintains humility in realizing the incomprehensible extents of God’s riches of wisdom and knowledge. This is yet another reminder for a truth-seeker of God to maintain a healthy degree of reservation. We are so exceedingly blessed on this side of the cross to see what many prophets and righteous men from the prior dispensation desired to see but did not see (Matthew 13:16); yet we are still finite beings with finite minds endeavoring to fathom an infinite God. Unfortunately, there is this propensity of human nature which lingers even among regenerated souls. It is the tendency to compartmentalize truth. This way of isolating certain truths from the full spectrum of truth leads to schisms between one group who sees a certain angle and another group which sees a different angle. Again, the manifold wisdom of God, being multi-dimensional, will certainly have many different angles which appear so different from other parts; and when different people are looking from different vantage points, it may be difficult to reconcile the diversities of views. Fundamental to the human condition is the tendency to be egocentric, whereby we elevate our own little perspective to be the paramount of truth, all while discounting the valid perspectives of other truth seekers of God. Each person may have a genuine revelation from the Word & Spirit of God, yet runs with it to an extreme so it cannot be reconciled with the revelations which others have brought to the other extreme. Thus we have the same kind of schisms the Apostle Paul rebuked the Corinthians for. Such narcissistic tendencies lead us to inventing unnecessary factions in which we are pressured to assume a set categorical stance of this side or that side – each side holding tight to their own ‘pet doctrine’ – or idol, which seals the door shut to any new and challenging information. Such a propensity not only leads to the Church splintering off into different sects, but devolving into full blowing cults! Satan, being well aware of this dialectic dynamic, exploits it with further agitation and discord to generate a raging inferno of clashing views. By maintaining humility – coupled with a larger and more well-rounded view of God, we may resist such discord and division in the Church – while rejoicing in the abundance of revelations others have to offer along with our own; which enables us to gain more of a panoramic perspective as opposed to a compartmentalized view. It was the Protestant Reformation which triggered this dialectic theme of Calvinism and Arminianism – as Reformers like Luther and Calvin discovered the doctrine of grace, a biblical and quite fundamental theme of the gospel, which differed from the works-based salvation projected by the Catholic Church. This was the very crux of the reformation as the doctrine of grace was ascribed to John Calvin and the Reformers in general, while the works-based salvation of the Catholic Church being named after Jacobus Arminius. Calvin and the other reformers also followed the Augustinian philosophy of using the power of the state to compel church attendance, an unbiblical philosophy which became the basis for the Inquisition. Thus, any Christians who were not in line with the ecclesiastical order of heads like Calvin, or Luther, or Zwingli, were persecuted as outcasts, or jailed or even executed as the Roman Church had done for so many centuries prior. And it was the same kind of New Testament descendants that endured through the Papal persecutions of the dark ages, who were known in the Reformation days as the Waldensians, as well as The Brethren & Hussites of Bohemia, who were branded with the derogatory name Anabaptists, and persecuted by the Reformers for holding views which were closer in line with the New Testament than those of their persecutors. Freedom of conscience in relation to the truth of the scriptures, was one of the main freedoms the Reformers originally protested for, but was indefinitely forgotten and even steamrolled by the Reformers who ultimately created a new rendition of the same hierarchical paradigm of the Roman Church they protested against. In light of this, the ironic parallels between Catholicism and Protestantism should not be too surprising, and any Christian seriously endeavoring to follow the New Testament pattern in both theory and practice is likely to identify more with those persecuted outcasts than with any institutional Church. It’s the very nature of the institutional paradigm which has such a persistent tendency to bind us to schisms and marginalize those who don’t play the same contentious game. No wonder there are countless multitudes of sects & denominations within the ‘Institute of the Christian Faith’. Not that God cannot meet us in those factions and work with us there, but sectarianism will always hinder us from achieving the full integrity and vitality of the New Testament model. I became advised this site by way of my uncle. I will be no longer good whether it placed can be compiled by means of your ex while nobody else understand these unique around the problems. You happen to be wonderful! Many thanks! I became advised this site by way of my uncle. I will be no longer good whether it placed can be compiled by means of your ex while nobody else understand these unique around the problems. You happen to be wonderful! Many thanks! Thanks this such a vital point to make sure to stay biblically grounded, not based off of a man’s view, whether new or old. And equally as important to be teachable and not take a “set categorical stance”, as we discern with the Spirit’s help. Great article, thank u! Huh. Can you elaborate the two please or it is me who can’t get it easily? On the other hand, Armenianists hold to the view that God’s election is ‘synergistic’ – that is to say that God’s chosen ones have had a cooperative role in God’s choosing. From a human perspective, the synergistic view may seem more sensible, but there is still biblical truth to the monogistic idea as well as the synergistic. This dual capacity may seem illogical, but it may be simply both in a proper sequence. Perhaps it is – that the sequence of God’s election begins as monogistic, and is confirmed with the synergistic aspect of our cooperation. Thus the seemingly contradictory diversities may simply be reconciled with a paradoxical sequence.